been picking a while but when i saw impressioning i thought thats a challenge i would love to learn. seen loads of vids and read articals so have the theory down pat. in practice though not going well! made a key holder and ordered some UL1 and UL2 blanks, have tried several locks including one i had a duplicate of so removed pins, inserted key and used a drill bit in the chambers to mark pin locations then filed a small amount where the pins were. so far i have broken 3 keys and only had a couple of marks that i were confident were pin marks. i have good eyesight and a magnifying glass and am usually quite good at picking things like this up so not sure why im not getting marks. think i must just not have the knack yet but will keep perservearing! Practice practice practice. You might want to start something a little easier like a Master padlock. 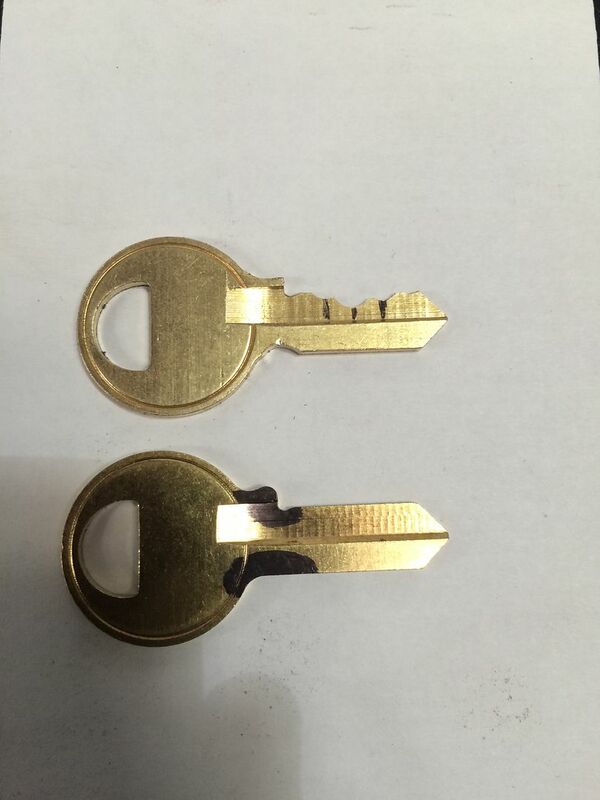 The are not the tightest keyway, but not usually particularly sloppy either. 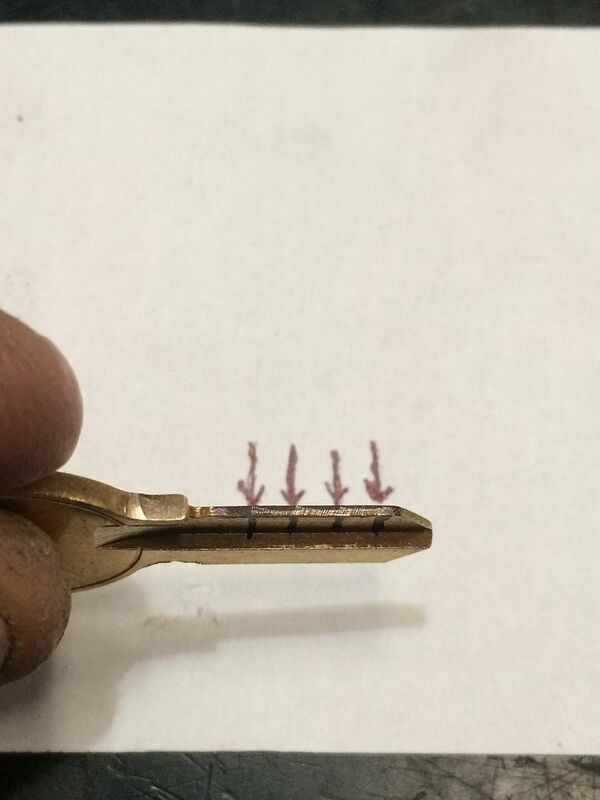 They leave good marks on the key and it will help develope your technique. The nice thing with the padlocks is you can put the horizontally in the vise so that when you are making your marks they won't slip around and also leave much better marks that way. If you are breaking keys then you are using too much force. Turn, rock it up and down and then remove. You don't need a lot of turning force, just enough to get the pins offset from the plug slightly. 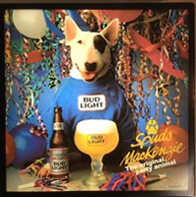 Good luck to you and welcome. There are a lot of very talented people on this forum willing to offer up advice and encouragement. 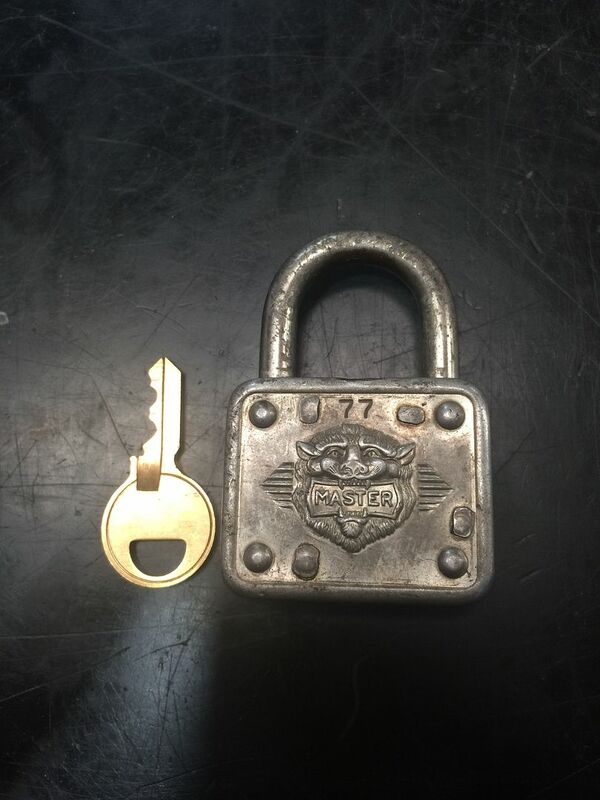 My first impressioning job was a Master #1 padlock. Nothing but a rattail file, and a C-Clamp for holding the keys. It was agonizing. Today, when I train apprentices, I start with wafer locks. The process it the same; but the marks are a lot easier to see. As confidence builds, we procede to pin tumblers. You both explained very nicely and he need to be hurry and forceful and learning need to much patience.Hope he will get there keep trying. muddassarusa wrote: You both explained very nicely and he need to be hurry and forceful and learning need to much patience.Hope he will get there keep trying. Seen engrish worse than this man… lol. Last edited by aeporia on Thu Feb 11, 2016 12:36 pm, edited 1 time in total. First lock I impressioned was a Master No. 3. Wafer locks are easier to see marks on, but are also more easily damaged from excessive force. That is less of a problem when the person is being taught by someone who has experience. But when the person's only trainer is the internet, it can be difficult. 1. Do not apply too much tension. I use maybe twice or at most three times the force I normally use to open the lock with a key. Any more, and you will break keys and risk damaging/deforming pins. 2. The more pins there are, the more difficult it is to impression when starting out. So a simple wafer lock or Master padlock is a good idea. The Master locks do make decent marks. 3. 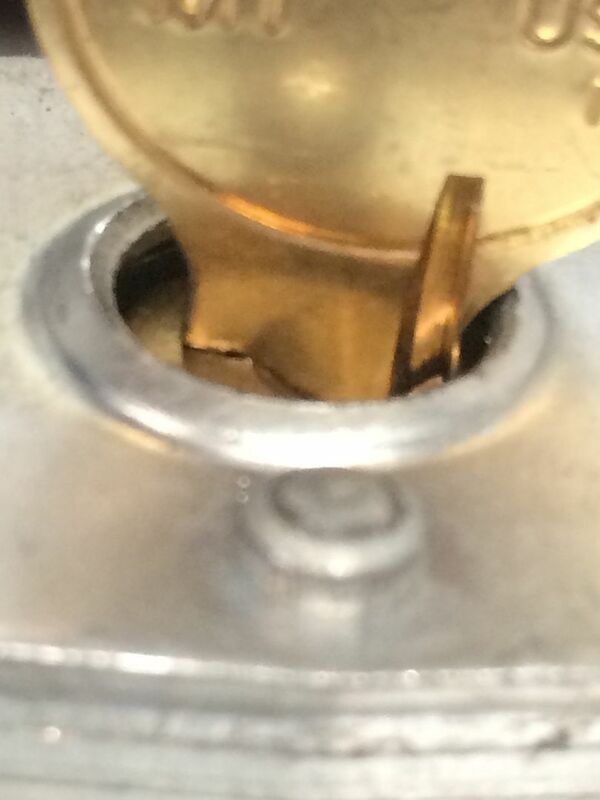 Do NOT lubricate the lock before impressioning. Impressioning requires friction between the plug/lock body and pins at the shear line. Lube it, and friction is reduced. 4. If the lock is too dirty, you can use something to clean the junk out, but then blow compressed air into the keyway to get rid of excess lubrication. 5. 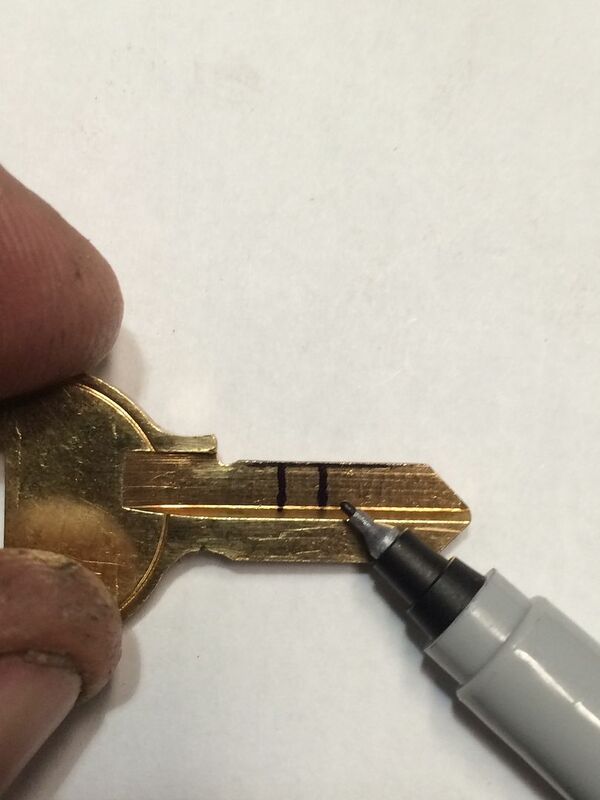 Make a mark with a Sharpie marker along the top edge of the key where the key pins ride. 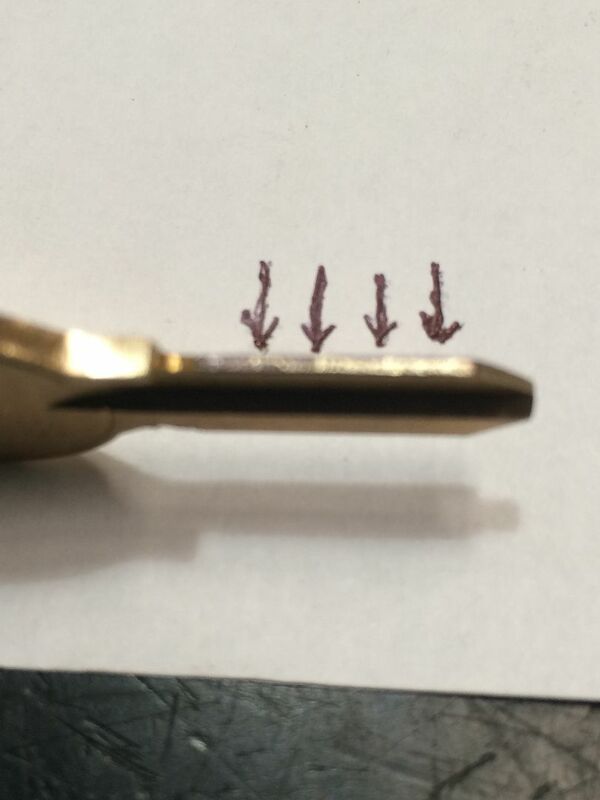 Put it in the lock and wiggle to make the pins just scratch the surface of the ink. Then draw lines straight down from the marks. The marks may wander slightly as you file down, but you will be able to see if what you think are impressioning marks are in the wrong place, and therefore probably not real impressions. 6. 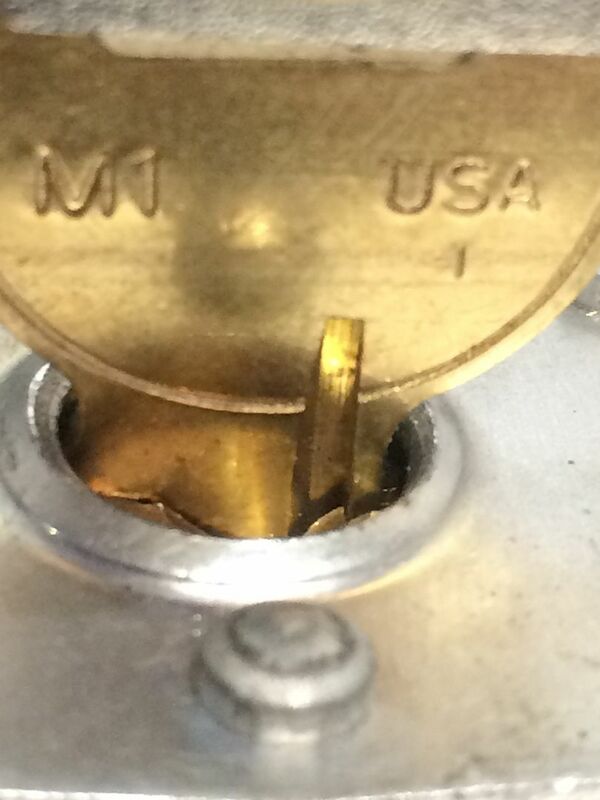 If you are impressioning a lock that has a cover plate around the plug (like a Master laminated lock), you may find it helps to file the shoulder so it is shorter and does not hit against the cover plate, and file the bottom of the key blank so it does not hit the cover plate either. 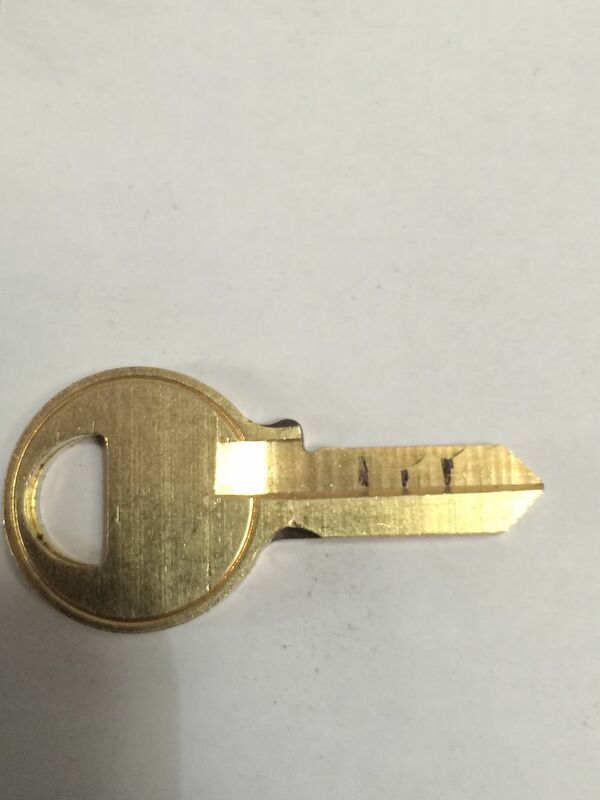 Here is an example of the filing down I am mentioning - made this key last week. Let me grab a lock and take a couple pics of what I have been talking about. (Slow day at work). Hitting at the top of the keyway (top in this case is where the key pins are located). 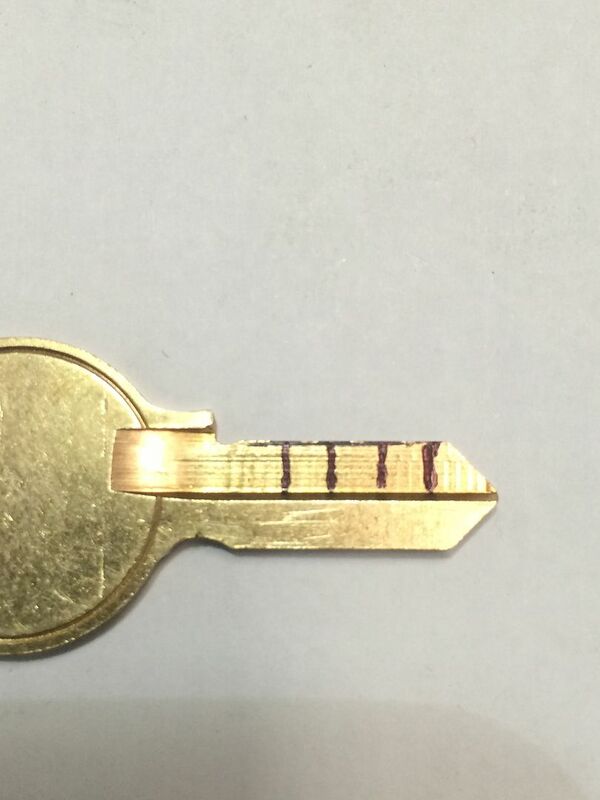 Impressioned key with shoulder and spine of the key filed away at the top, normal key blank below, with a marker showing the general area where I will be filing. marked blank on the bottom, filed key on top. Now you can see where I filed the shoulder down and the spine of the key blade. That trick has helped me so often when impressioning locks with a cover plate that I just automatically do it if the lock has a cover plate. Ink the edge of the key blade. Put the key in the lock. Turn it in one direction until it stops (light force - you are not looking to make impressions yet), then move the key bow away from the key pins. Release tension on the key blank. Turn it the other way until it stops (again, light force - you are not looking to make impressions yet), then move the key bow towards the key pins. Now remove the blank and look at it. You should see marks for all (or nearly all) of the pin locations. Note: These are NOT impressions, just how to locate where the pins are. These marks are actually pretty easy to see, but hard as heck to photograph. So made arrows on the paper to point them out. Now use a fine point marker to make lines straight down from the marks. This is so you do not 'drift' to the side when filing later. I better quit now before I take over your thread. I should do a pictoral thread on beginning impressioning, since the questions come up frequently. Anyway, hope that helps a little. Nice Gordon alot of info there. GWiens2001 wrote: First lock I impressioned was a Master No. 3. Wafer locks are easier to see marks on, but are also more easily damaged from excessive force. That is less of a problem when the person is being taught by someone who has experience. But when the person's only trainer is the internet, it can be difficult. Gordon I am always amazed at the amount of effort you put into stuff. It is very impressive the quality of the stuff you do. Last edited by mdc5150 on Thu Feb 11, 2016 4:08 am, edited 1 time in total. Mostly good advice. I would add, step 0. Look inside the lock and visually count the pins. 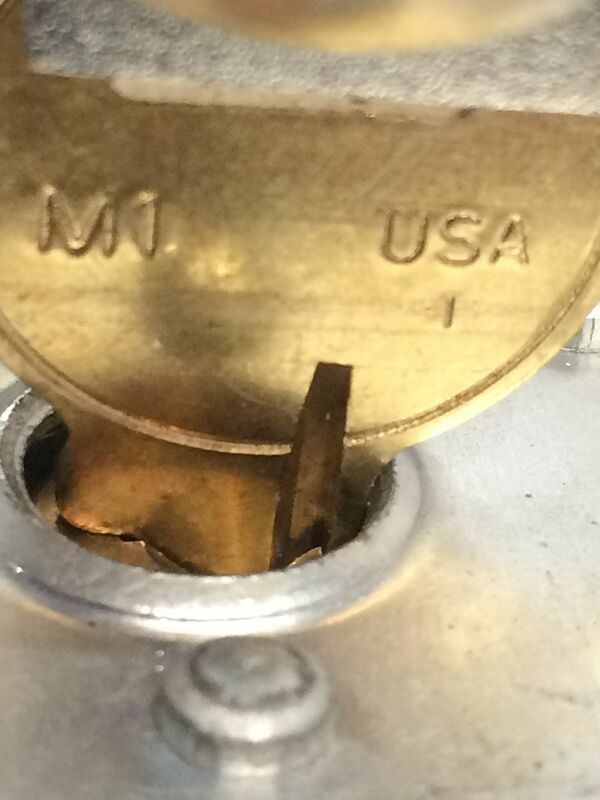 And while you're at it, see if there are any really shallow cuts by literally seeing the entire key pin. 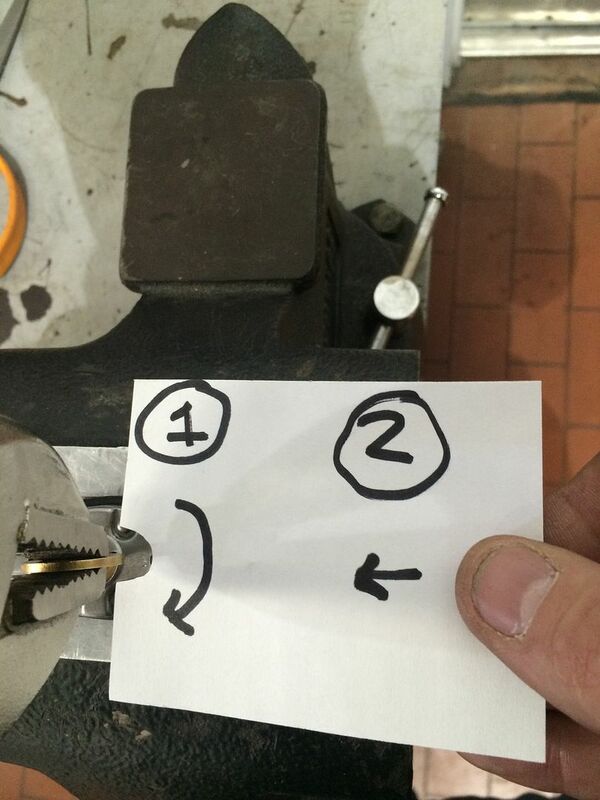 Do you have any idea how many times I've come into the shop and some of the guys have been spending all day trying to impression a lock? The first thing I do is look inside the lock and then ask them "why they are using a 5 pin blank in a 6 pin lock?" Followed by "oh and that really deep cut on most of your blanks is the shallowest cut in the lock." I would cross off number 3. Do not lube the lock. That depends. Impressioning a lock that is in desperate need of lube is a much much much much much much much bigger problem than wiping off the key with a rag every time you pull it out of a lock. If the lock is working correctly, which basically means it already has the correct amount of lube. I agree, don't lubricate it. Here is the biggest piece of advice. When learning, there is no substitute for practice. LOTS of practice. It takes time and practice before you start to distinguish real marks from fake marks, not to mention getting the correct amount of tension and key movement to get those marks. Going through 3 keys is nothing, keep going, happy filing. 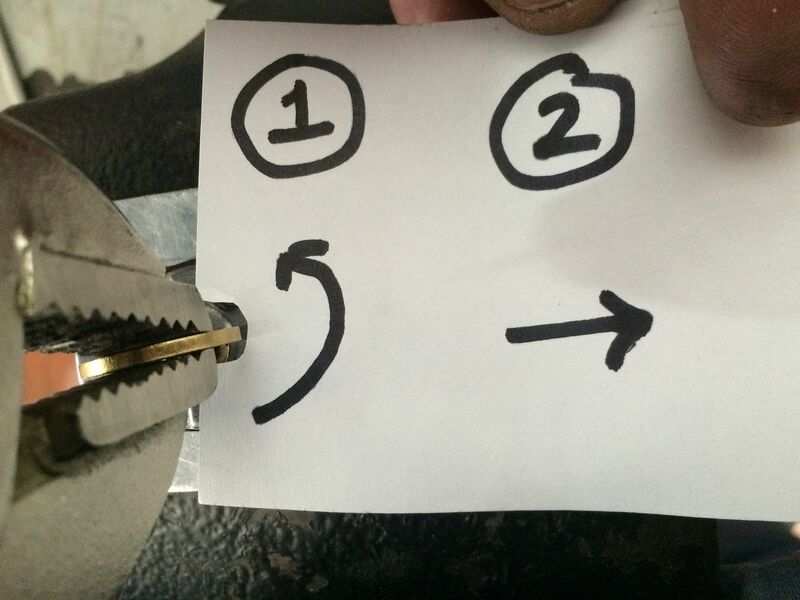 Farmerfreak wrote: Do you have any idea how many times I've come into the shop and some of the guys have been spending all day trying to impression a lock? The first thing I do is look inside the lock and then ask them "why they are using a 5 pin blank in a 6 pin lock?" Want a good laugh, Farmer? Remember that American 747 I sent you to open? The guy at a shop here in town that was going to get me some blanks when they could not get it open showed me 8 or 9 keys that another locksmith there had tried to impression. 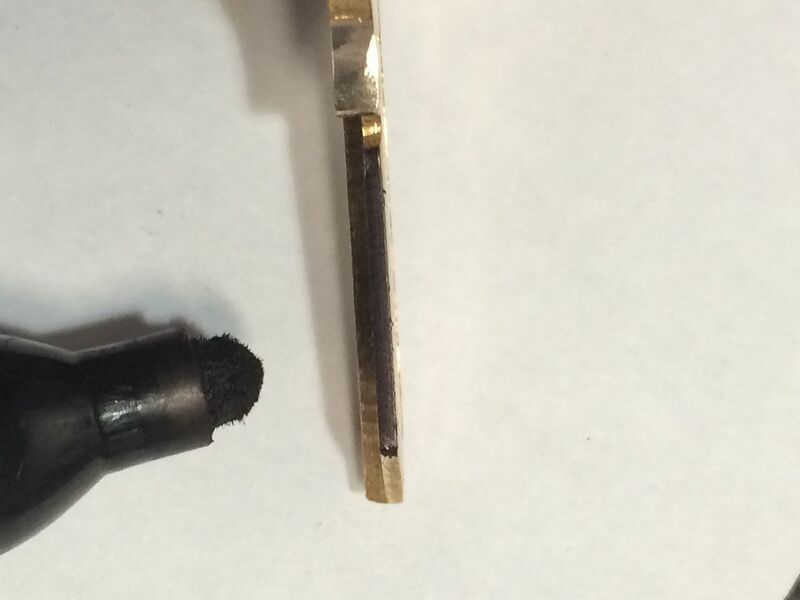 I asked the same question... "why are you using a 5 pin blank in a 6 pin lock?" He looked at me like I was crazy and said "These are six pin blanks." When I showed him they weren't, he then said "It's a five pin lock anyway". It turns out they pin all those six pin cores with five pins. Only tried them because they are the only shop in town that stocks blanks for that keyway. I just asked for the lock back and sent it to you to open. Got my own blanks and filed out some keys after you got it open. Thanks again! You've come to the right place - lots of incredibly talented and knowledgable folks around here who are willing to take the time and pass it along. And wow, great advice farmerfreak and Gordon - loving it! Copy + pasted those golden nuggets into my 'impressioning' file. Gordon that is the best reply i have ever seen on a forum, great advice and really think this is going to help me. 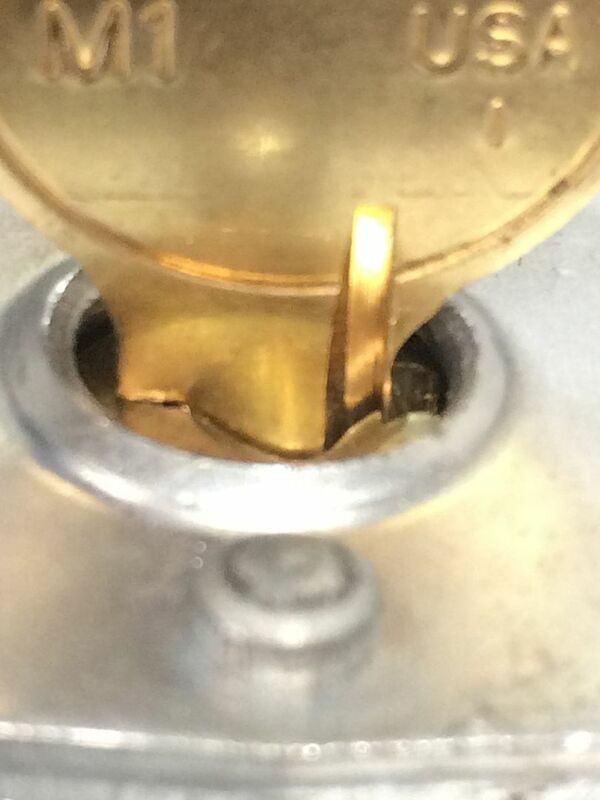 where do you get your 4 pin blanks from as having probs finding any multipacks and also how do you guys know what profile fits each lock, is this something that comes with experience. really appreciate the help and still cant get over how good Gordons reply was! couple of picks of my makeshift holder, had some polycarb bar left over from a work project, cut a groove in front and jubliee clip to tighten.